Definition: The instruments in which the measured quantity produces physical effects which deflect or displace the moving system of the instruments in known as the deflection type instrument. In other words, the instrument in which the deflection provides the basis for measuring the electrical quantity is known as the deflection type instrument. Such type of instrument is used for measures under dynamic condition. The deflecting type instrument has opposite effects which oppose the displacement of moving systems. The opposite effect is so designed that their magnitude increases with the increases in the deflection or displacement of the moving system which is caused by the measuring quantity. The balance is attained when the opposite effects are equal to the cause of producing the deflection or movement of moving points. 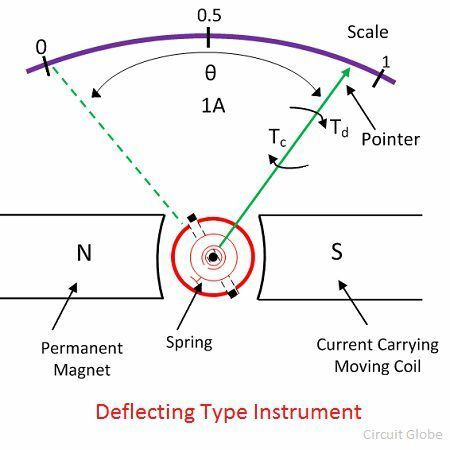 For example: In a permanent magnet moving coil ammeter, the deflection of the moving point is directly proportional to the current (the quantity under measurement) flow through it. The torque Td acting to the coil is directly proportional to the current. And it is expressed in the form of an equation shown below. Where, G is constant, and it is independent of flux density, the area of moving coil and number of turns. Where K is the spring constant, and their value depends on the material and dimension of springs. The value of the measured quantity and current depends on the deflection angle θ and the meter constant G and K. The value of currents is directly read regarding deflecting angle θ, which is calibrated by considering the value of G and K.
The following are the disadvantages of deflection type instruments. The accuracy of the instruments is low. The sensitivity of the instruments is less than the null type instruments. The value of the measured quantity depends on the calibration of the instruments.